When new parts are introduced that are three studs long, eyebrows are sometimes raised in the fan community about their necessity. (The same usually goes for corner pieces, too.) Discussions would certainly always happen within the LEGO Group about whether a three-long part is genuinely warranted, and in this case I believe it certainly is because this part is not POOP... i.e. you can't make it out of a 1x2 panel and a 1x1 panel, because a 1x1 panel has a corner wall. Also you will be able to offset this part by a half-stud using the two pins on the underside (which, although I haven't seen one, it must surely have). 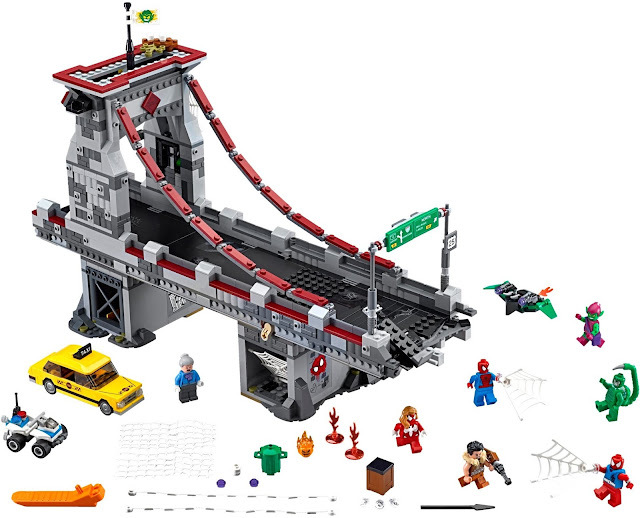 So far it only comes in one set, 76057 Spider-Man: Web Warriors Ultimate Bridge Battle, which I have at least had the pleasure of seeing, and I think is a very cool set. (This is coming from a man with little love for Super Heroes sets.) It's the biggest set that LEGO designer Justin Ramsden has yet worked on - he's the former LEGOLAND Windsor modelmaker who appeared in the Channel 4 LEGO documentary as he scored the job - and he's done a great job. I especially like that multiple copies can easily be combined into a larger bridge, but it is fine as-is... for one of these "it's a chunk of a larger scene"-style sets, you don't feel shortchanged by what's offered. Whether it offers value for money is a different decision, though. It retails for £89.99 / $99.99 / 99.99€, has 1,092 pieces and weighs 1.66kg. This one is really interesting. 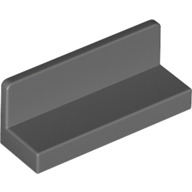 If you rotate it from how it is shown in this image it's essentially a 1x1 round plate with recessed stud, but instead of the usual 'anti-stud' underneath, it has a 3.18mm bar laid horizontally. Spider-Man holds the bar in his hand and the web is inserted into the recessed stud... at last, minifigs can point something forward with their arm outstretched... but I'm sure you can think of a gazillion other fabulous uses. I won't discuss these further as I intend to feature this part in a post of its own. 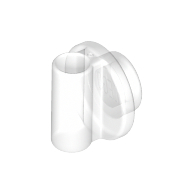 But for the record it comes only in Transparent [TLG]/Trans-Clear [BL], has an Element ID of 6153264 and a Design ID of 25893, TLG call it 3.2 Shaft W/ Knob (and, Justin remarked, designers call it "the ring") and BrickLink are yet to add it. There's also a 10x10 textile net that I believe is a new design, plus plenty of exclusive minifigure parts and some recolours of useful parts. Take a more detailed look by browsing the Brickset parts inventory. Thanks to Huw once again for this database, which alerted me to this new part and details of the set it comes in. The net is definitely not new. I have a zillion of em already. Figured "Dunno what I'll use these for, but they're cheap so sure." Ironically the web and the hand connector piece are most interesting to me. But I was just thinking last night that a 3 long panel would be nice as I was experimenting with some panels. 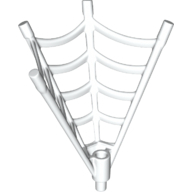 Do you know if Lego could ever make corner parts for the 1x2 bow piece? The one that's like half of those telephone looking bows? I sorely need corners for those. :P I never realized corner parts were so contested with the AFOL community. Why is that? You're sure you're not thinking of any of the flat web pieces? Re the existing 10x10 net - this one has been given a new ID, so there might be a design difference, or not. I don't have either to compare. When corner tiles were released I was thrilled, but I noticed many members of my LUG were non-plussed, uncertain why they were necessary when other combinations can do the same job. Indeed when I blogged about them I found very few situations where they were essential. Nice to have, definitely. Above all they provide additional strength on corners, which I feel is especially great for children who don't naturally consider such things. Corner bows sure would be ace! I think the 2x2 Corner Tile really is under appreciated, especially for micro scale building. The perfect example is the Dimensions A-Team Van, where the fenders over the rear wheels are black corner tiles that allow for the snot building above to feature the great printed tiles with the black and red diagonal print which turns it from an ok model into a wonderful one. It's a subtle use but hard to replicate without such a piece. I wonder if you could build a whole spider web out of several of the Spider Man web pieces. If so, would it work for it to be an orb web? Or would it have to be a random web, like a black widow spider's?